Time For Good.A Good Deed For a Good Deal. 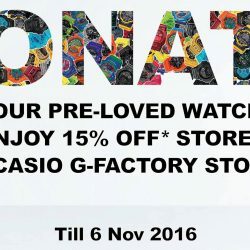 From now till 6th November, bring a smile to the less fortunate by donating your pre-loved watches (any brand in good working condition) and receive 15% OFF storewide except for the MR-G series at any G-Factory outlets islandwide. Casio reserves the rights to refuse defective watches or counterfeits.